Update: Post your reviews here. Since I vastly underestimated the amount of time it takes to read Anne Rice novels, I still have a lot left to read after the 2012 Anne Rice Challenge. So I've decided to host the challenge again! 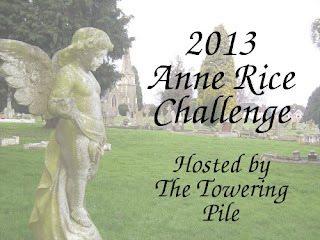 Join me in one of several levels, according to how many Anne Rice books you plan to read in 2013. Ebooks are fine. Audiobooks are fine as long as they are the unabridged versions. Rereads and crossovers with other challenges are fine. You can change your level at any time. The challenge goes from January 1st to December 31st, 2013. If you read, for example, the edition that has the first 3 Vampire Chronicles books together in one volume, that still counts as 3. We're going by how the books were originally published. All books written by Anne Rice count, not just the Vampire Chronicles, including those written under a pseudonym. You can sign up any time from now until November 30, 2013. Thanks for joining! And wow! Last year I went for the Marius de Romanus level, but only ended up reading 7 books. They're long! Especially The Witching Hour (really good though!). I own the entire library of Anne Rice books and revisit them often. They are my favorite escape. I love to reread the first three Vampire Chronicles. So good! All right, I'll take the bait. I hope it's not too late to join! Thanks for joining! Don't forget to add your sign up post to the linky! I have not read a single book by Anne Rice. I am going to give it a try. Glad to have you join us! I recommend Interview With the Vampire as a first Anne Rice book, but it depends on what you're interested in. I am upset that I am currently reading an Anne rice book now. I want to stop reading it so that it I can count it toward this challenge. But I will be one book short on another challenge. ARGH! What to do? What to do? Thanks for hosting the challenge!! All signed up! Thanks for hosting. Just signed up, thank you for hosting this challeneg. BTW could you tell me where shall I post the reviews??? Can't find the linky.